My sons are finally both old enough that we can take family bike rides and not lose one due to heat, tiredness, or boredom. I have been waiting for this moment for a long time. Yesterday was Memorial Day and so my husband and I both had off. We were working around the house trying to get some things off of our to-do list but my youngest son was bored. So I suggested a bike ride. He is always up for having fun. So I convinced my oldest son to come along. I was thinking that my husband was going to continue his organizing the garage project but he jumped at the opportunity to stop working. So the four of us headed out on our bikes for a nice bike ride. It was a beautiful day with only occasional light sprinkles here and there. We need to slowly get the kids ready for some serious trails coming soon during our summer break but today we were taking our normal ride around the area. We headed toward the middle school and my youngest son and I were in the lead. As we approached the parking lot of the middle school, I all of a sudden got hit with this memory of about three years ago when I was teaching him how to ride his bike. It actually took us two summers before he truly got the hang of it. He didn’t want us to take his training wheels off and every time we attempted to I would hang on to the back of the bike and run along side of him. He would tell me not to let go. I certainly got my workout those two summers. We would do this up and down the parking lot over and over and over again. I thought he would never want me to let go. Then all of a sudden one day during the second summer, I started to hang on to the back of the bike and run along side him and he turned and said to me, “You can let go now.” I couldn’t believe it. He was doing it. He was riding his bike without me. Now flash forward three years and he and I are riding along side of each other and talking about stuff. I actually got a little choked up and teary eyed as I was remembering those moments when he was just a little squirt. It was a good day! A day of remembering the past and enjoying the present with my family. 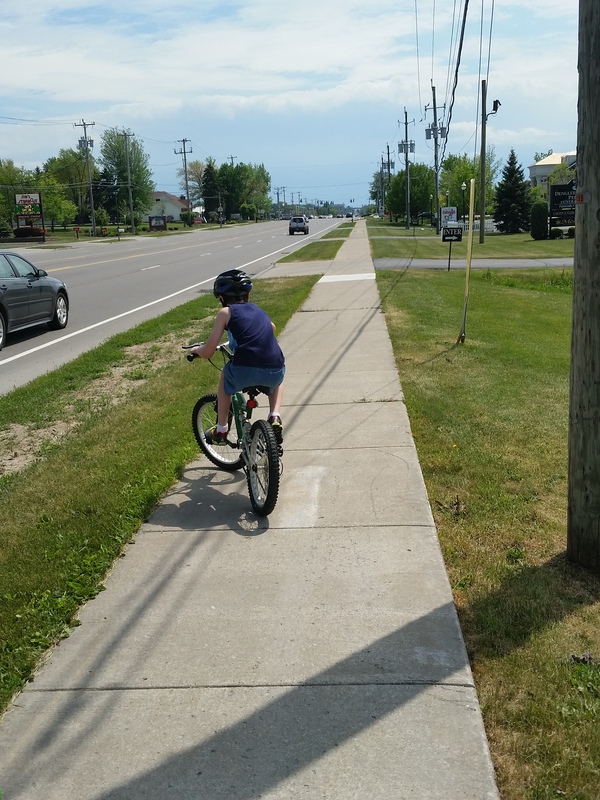 This entry was posted in family, kids, life and tagged bike riding, boys, family, family life, kids, little things, small moments. Bookmark the permalink. Thanks Amy for sharing your moment. I hope your daughter’s arm is better now. What a terrible thing to have to go through – two surgeries. That is quite the moment in your memory bank. Some great conversations happen on a bike trail. Enjoy!